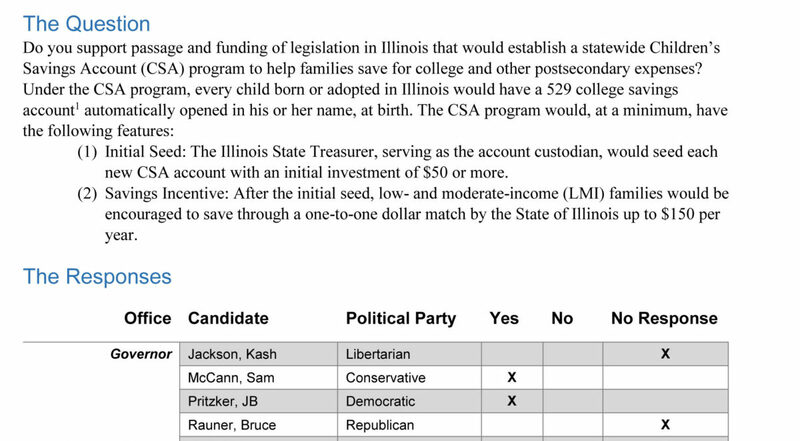 Woodstock Institute sent a questionnaire to all candidates for Governor, Attorney General, and Treasurer who will appear on the ballot in the 2018 General Election in Illinois asking their position on establishing a statewide Children’s Savings Account (CSA) program. In addition to answering as to whether they support such a program, candidates had the opportunity to provide comments. No candidate provided comments. Woodstock Institute does not endorse or oppose any candidate. Candidates’ fitness for office should be judged on a variety of qualifications beyond their responses to this question. Initial Seed: The Illinois State Treasurer, serving as the account custodian, would seed each new CSA account with an initial investment of $50 or more. Savings Incentive: After the initial seed, low- and moderate-income (LMI) families would be encouraged to save through a one-to-one dollar match by the State of Illinois up to $150 per year. In addition to their questionnaire responses, three of the candidates have taken official action in connection with legislation introduced in 2017 (HB 3691) that would have established a statewide CSA program in Illinois. The bill passed the House and passed the Senate after being amended, but was not called for a required concurrence vote in the House before the House adjourned for the year. State Sen. Sam McCann and State Sen. Kwame Raoul voted yes on the bill. Illinois Treasurer Michael Frerichs filed witness slips, and his office provided testimony, in support of the bill when it was heard in committee. With the addition of Pennsylvania in 2018, five states have statewide CSA programs: Connecticut, Maine, Nevada, Pennsylvania, and Rhode Island. There are significant differences among the programs. For example, four states open accounts at birth, but under the Nevada program a CSA is opened for every child entering public school kindergarten. The program’s funding mechanism is another key component that differs among the states, as described below. There is an extensive body of research about CSAs and their effects on educational outcomes and childhood development. For example, a 2013 study found that a child with school savings of $1 to $499 before reaching college age is almost two and half times more likely to graduate from college than a child with no savings. A list of some key CSA research reports is included at the end of this paper. CSA programs can be publicly funded, privately funded, or both. Pennsylvania intends to fund its program with surpluses in the state’s existing college savings program. Maine’s program is funded by a private foundation, the Harold Alfond Foundation. Based on the number of births in Illinois in 2016, the cost of seeding every CSA with an initial investment of $50 would be $7,723,350. Additional costs include program administration and the one-to-one dollar match for LMI families that choose to deposit funds into a CSA account. Assuming 20 percent of LMI families would deposit at least $150 into their CSA annually, the cost of the match in year one would be $1,734,150. Therefore, the total cost in the program’s first full year – not including administration – would be $9,457,500. If all other variables remain constant, the cost for the one-to-one match would increase every year as a new cohort of children is born and added to the program. Illinois Dept. of Pub. Health, Vital Statistics, http://www.dph.illinois.gov/data-statistics/vital-statistics/birth-statistics. According to the U.S. Census Bureau’s American Community Survey, 55,937 women living in LMI tracts in Illinois gave birth in 2016. According to the Centers for Disease Control, 3.34 percent of births are twins. So, the total number of babies born to LMI mothers in Illinois in 2016 is estimated to be 57,805.